From Rogue Farms of Newport Oregon, 6 Hop IPA is a citrus forward west coast style IPA all the way. The nose is citrus and floral. Orange, lemon and grapefruit are in the middle. The finish has pine and lemon. Really lovely beer. I give it 4.5 out of 5. This entry was posted in Reviews and tagged Ale, American IPA, IPA, Oregon, Rogue, West Coast IPA on December 4, 2018 by Xander. Extrovert is an American IPA from the Left Hand Brewing Company. It pours with a voluminous head that disappears quickly. The nose is grassy, with a lot of lemon. The middle is pleasantly tropical with lemon, some mango and a hint of peach. The finish is dry and slightly buttery. The body is medium and the alcohol is 7.1% ABV. A really nice middle of the road American IPA. This entry was posted in Reviews and tagged Ale, American IPA, Colorado, IPA, Left Hand on December 1, 2018 by Xander. 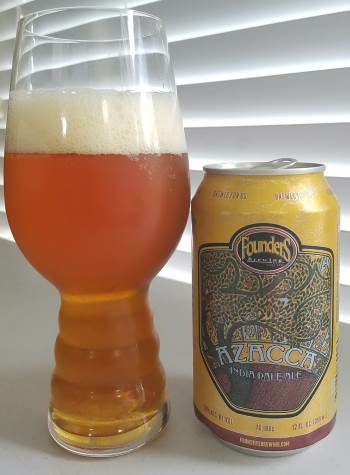 A tropical IPA from Founders, Azacca has notes of lemon and mango and a buttery finish. I give it a 3.8 out of 5. This entry was posted in Reviews and tagged Ale, Founders, IPA, Michigan, Tropical IPA on August 23, 2017 by Xander. 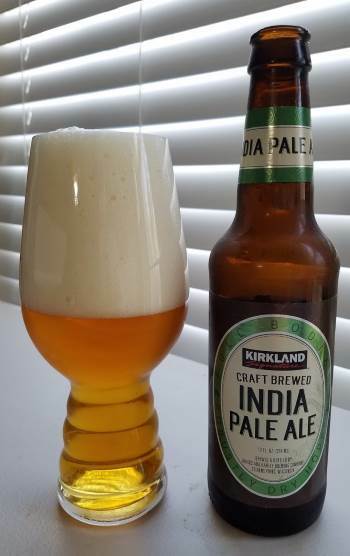 Kirkland Signature is the name of Costco’s store brand, and this American IPA is brewed for them by the Bricks and Barley Brewing Company in Wisconsin. The nose has lemon and some sweet malt notes. The middle is bitter with some pine, a bit more lemon and breadiness. The lemon and sweet bread continue into the finish but the pine fades away. 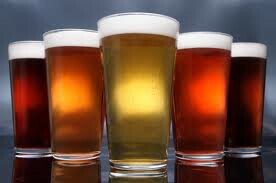 It’s a simple IPA, not complex, light to medium body and 6.9% ABV. It’s not bad, but also unremarkable. I give it a 3.6 out of 5. This entry was posted in Reviews and tagged Ale, American IPA, Bricks and Barley, IPA, Kirkland Signature, Wisconsin on August 8, 2017 by Xander. Stone brews a special IPA for their anniversary each year, and this year, their 20th, it’s Citracado IPA, an Imperial IPA brewed with citra hops and avocado flower honey. Like all Stone beers, the hops are important. This one is one of the hop bombs, so if you like Ruination, this might be for you. The nose is floral and citrusy, with orange and grapefruit notes. The middle has a ton of lemon and grapefruit, and sweetness from the honey over a big malty backbone that give it weight. It fades to grapefruit rind and pine bitterness in the finish, and is never subtle. The body is heavy and the alcohol is 9.0% ABV. This is a special beer, brewed for a special occasion, and it more than does it justice. This is an outstanding beer. This entry was posted in Reviews and tagged Ale, American IPA, California, DIPA, Imperial IPA, IPA, Stone, West Coast IPA on March 11, 2017 by Xander. A double IPA from Triple C Brewing in Charlotte, Baby Maker is an American Imperial IPA. The head is light and fluffy and voluminous. The nose is lemon and pine. The middle is sublimely hoppy with orange, lemon, and grassy notes. The malt comes through in the finish as sweet, sticky bread dough, but still balanced by pine and citrus. The body is medium, and the alcohol is 8.5% ABV. A really nice Imperial IPA, and one I’ll definitely be drinking again. I give it a 4.6 out of 5. This entry was posted in Reviews and tagged Ale, American IPA, Charlotte, DIPA, Imperial IPA, IPA, North Carolina, Triple C on March 1, 2017 by Xander. A good vigorous head. A lot of orange and some floral notes in the nose. Well balanced middle with some pine, orange and grapefruit. Pepper and lemon in the finish. Medium body and very precise 6.43% ABV. A really delicious IPA. I give it a 4.7 out of 5. This entry was posted in Reviews and tagged Ale, American IPA, Colorado, IPA, Oskar Blues on February 24, 2017 by Xander.